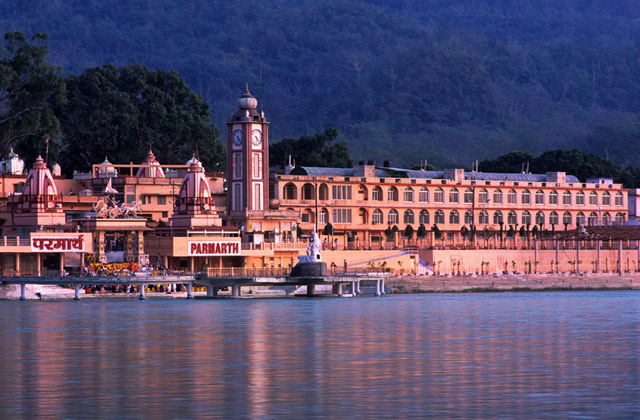 From the 1st till 7th of March the annual, and by now 16th, International Yoga festival takes place in Rishikesh. As usual, it will be hosted by Parmath Niketan Ashram at the holy banks of mother Ganga, presenting an array of Indian and Western yoga professionals from yoga teachers to saints, meditators and spiritual leaders alike. Based on the origins of yoga, the festivals aims to present all aspects of yoga, from asana classes of many different lineages to kirtan, fire aarti at the river and satsang with revered spiritual beings. Among the presenters are H.H. Pujya Shankaracharya Swami Divyanand Teerth, H.H. Pujya Swami M.M. Asanganand Saraswati, H.H. Pujya Swami Dayananda, H.H. Pujya Swami Chidanand Saraswati, H.H. Pujya Mooji, H.H. Pujya Prem Baba, H.H. Pujya Radhanath Swami, Ven. Bhikkhu Sanghasena, Padmashri Bharat Bhushan, Gurmukh Kaur Khalsa, Sadhvi Abha Saraswati, Sadhvi Bhagawati Saraswati, Rujuta Diwekar, H.S. Arun, Deepika Mehta, Laura Plumb, Janet Attwood, Kia Miller, Tommy Rosen, Gurushabd Singh Khalsa, Jules Febre, Hikaru Hashimoto, Bharath Shetty, Brian Siddhartha Ingle, Mohan Bhandari, Yogiraj Vishwapal Jayant, Anand Mehrotra, David Wei, Maa Gyaan Suveera, Erica Kaufman, Yuva Dayalan, T.A. Krishnan, Anandra George, Sukhmandir, Chandanni Miglino, Mark Robberds, Komilla Sutton, Bhavini Kalan, Dr. Urvashi Inamdar and more, combining the ancient wisdom of the East with the West. The schedule is filled with activities available from 4 am until 9:30 pm. To attend the festival you can either stay at Parmath Niketan and book an all-week pass or get a weekly non-residential pass, which includes all classes and meals. Prices range between 400 – 600$. Other than that there are daily passes for 60$ and a special Seva Celebration for the International Women’s Day on March, 8th, which can be attended by donation. In case you can´t attend this time, we´ll be present at the festival covering the event, so come back here, to read all about it! It’s good to take part. It will help to rejuvenate.